Dry style Wonton Noodles tossed in a dark soy sauce dressing served with wontons, braised mushrooms, and pickled green chilies. Wonton Noodles also known as wonton meen in Malaysia is very popular and can be found in most food courts across the country. As with many rice and noodle dishes there, it is eaten throughout the day. Wonton Noodles come in two styles. 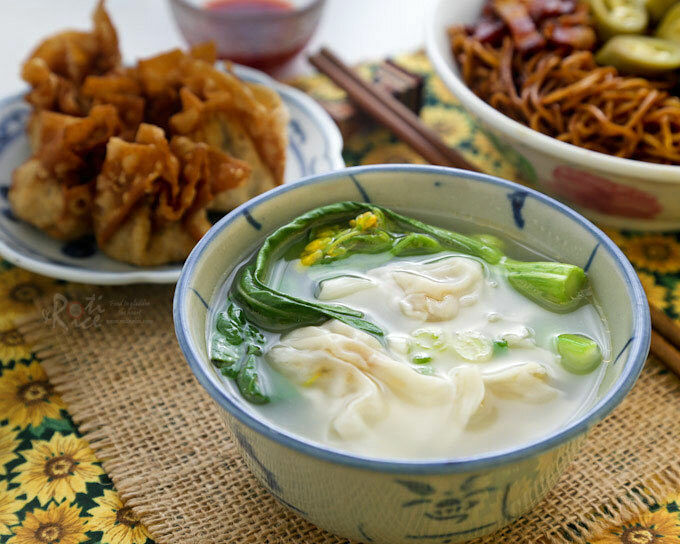 It can be served in a clear soup broth topped with boiled wontons and Char Siu (Chinese Barbecue Pork) or kon loh (dry style) tossed in a dark soy sauce dressing topped with Char Siu and a bowl of Wontons in soup on the side. Both styles are equally tasty and each style has its fans. 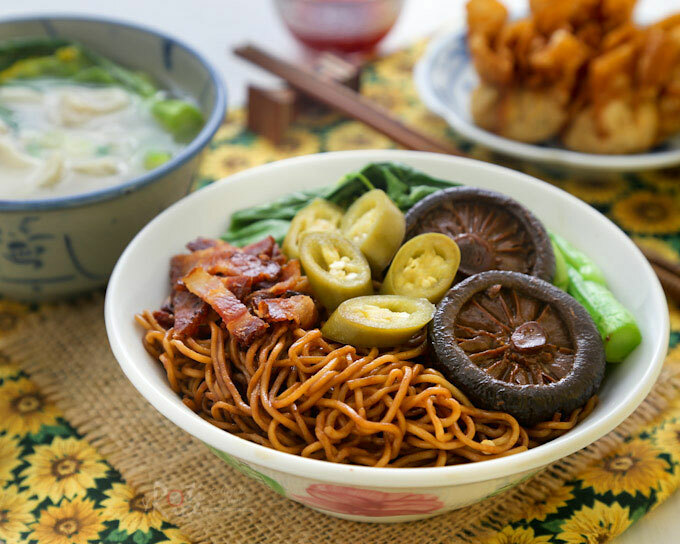 Noodles in Malaysia are often served with a small dish of red or bird’s eye chilies. A little soy sauce is usually poured over the chilies. For Wonton Noodles though, Pickled Green Chilies are the norm. Whenever I think of Wonton Noodles, I think of Pickled Green Chilies and vice versa. They just seem to be made for each other. Recently, I made some Pickled Green Chilies and Garlic and it instantly reminded me of Wonton Noodles. Fortunately, fresh Wonton Noodles can be easily found here at the Asian markets. I bought a packet of 5 bundles of noodles to make this tasty dish. Of course I had to make the Wontons or it would not be Wonton Noodles. I deep fried some of the wontons because Ro-Jiro prefers them crunchy. He also had a bowl of wontons in broth. That’s the advantage of eating it at home. You can have as many wontons as you want. Only 3 to 5 wontons come with a bowl of noodles at the food courts. One of my dad’s favorite wonton meen shop is Toong Kwoon Chye coffee shop at Jalan Bukit Bintang, Kuala Lumpur. Their kon loh wonton meen is unique in that it comes topped with melt-in-the-mouth braised mushrooms. Apparently they have been around since the 1930’s. When I went there with my parents as a kid, they were already very established and popular. We usually had to wait in line to be seated. While it may not be the heathiest, dry style Wonton Noodles are best tossed in pork lard. In my version below, I used fried bacon lard as bacon is more easily available here. The crispy bacon is then sprinkled on the top. It was lips smacking delicious! Wash and soak dried mushrooms in hot water for at least an hour. When they are nice and plump, remove stalks. Strain and reserve ½ cup (120ml) soaking liquid. Heat vegetable oil in a medium sized saucepan. Sauté garlic for 1 minute. Stir in mushrooms then add dark soy sauce. Pour in soaking liquid and chicken stock. When liquid comes to a boil, cover, reduce heat to low, and allow it to simmer for 45 minutes. Turn off heat when done. In a large fry pan, cook bacon until crispy. Remove and reserve 6 tablespoons bacon fat. Cut bacon into thin strips. Place 1½ tablespoons bacon fat in each of 4 separate bowls. Add 1 tablespoon dark soy sauce and 1 tablespoon regular soy sauce to each bowl. Bring two large pots of water to boil. Scald choy sum for 1 minute in one pot. Remove and set aside. 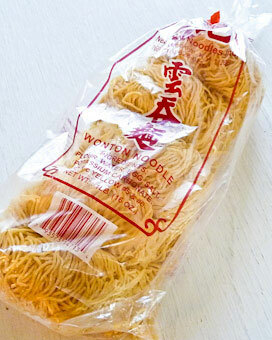 Add a bundle of wonton noodles into the water and boil for 2 to 3 minutes or per packaging instructions in the same pot. Scoop up noodles with a metal strainer and rinse under running water in the sink. Then dip noodles back in the other pot of boiling water to reheat it. Transfer noodles to bowl with soy sauce mixture. Toss noodles to coat with sauce. 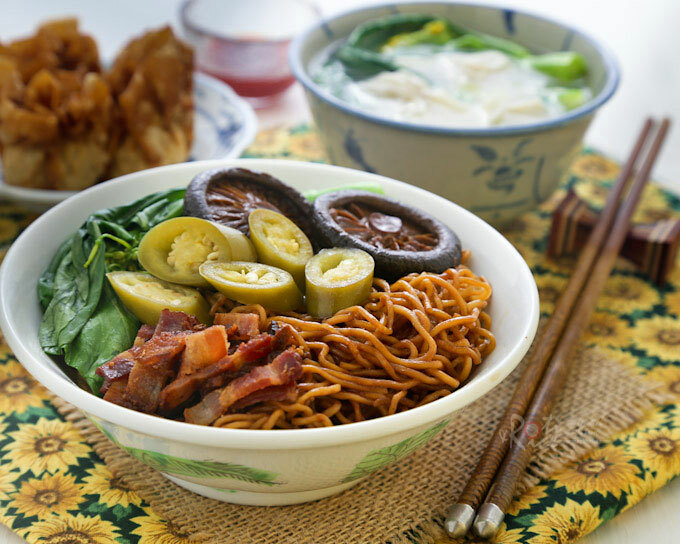 Top with cooked choy sum, bacon, and braised mushrooms. Also drizzle 1 to 2 tablespoons of braised mushroom liquid over the noodles. Repeat with remaining noodles. 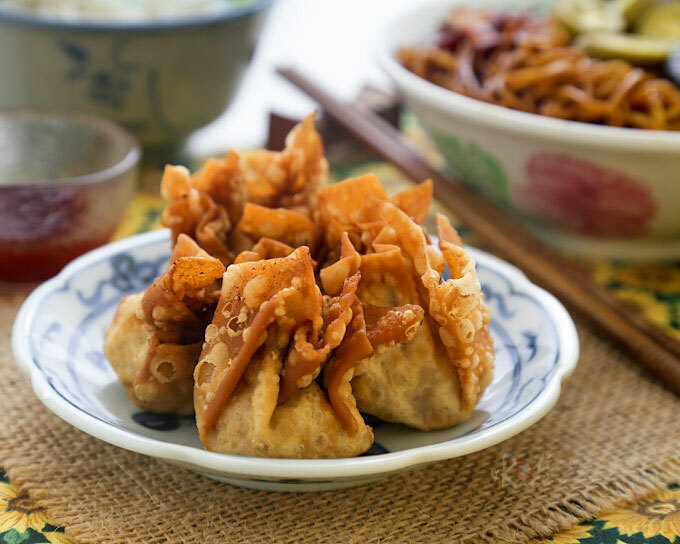 Serve immediately with boiled or deep fried wontons and pickled green chilies on the side. I love wantan noodles! And yes, pickled green chillies is a must. 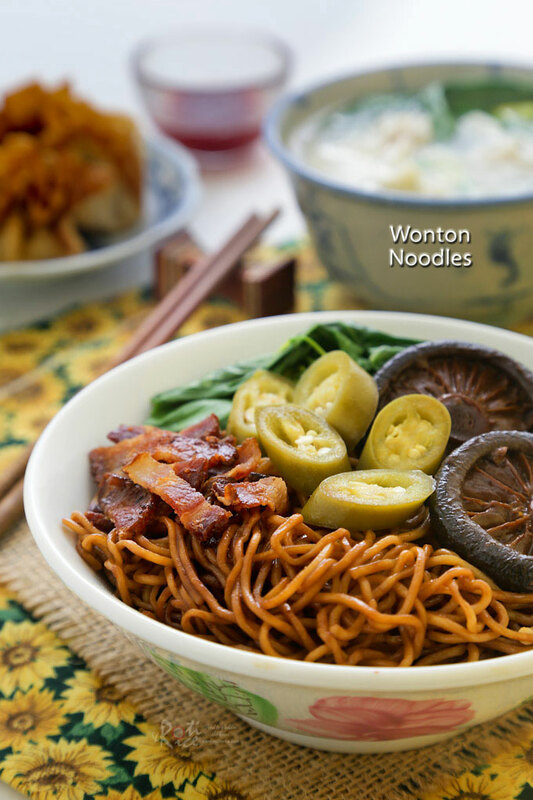 Ooo….I’m all for noodles and this one looks good! Can’t resist a bowl of wantan noodles, with plenty of chilli! This must taste so good with bacon, I’ll try this soon! Our all time house favourite – wontons AND wonton noodles! Kids love both types of wontons. If I ever make fried ones, they don’t really make it to the dining table. My kids are hovering at the backgrounds like vultures to snap them up. I like your take on the bacon lard, I bet it makes the noodles extra tasty and silky. I must try the bacon lard when I make this next time. Lovely pictures as always!